Product Application: (ease of application of the product, for example for eyeshadow, is there fall out, creasing, etc. 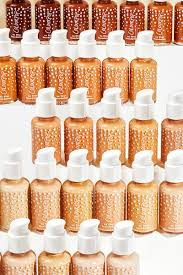 Overall Product Presentation: shade variation (if eyeshadow), women of color friendly, pale people friendly, universally applicable to many skin tones, desire for repeated use, would you repurchase the item again, is this product associated with a particular trend or is does it market the companies individuality, does the product set a new & innovative trend, is the product effective (does it do what it’s designed to do), does the product have potential multiple application opportunities (i.e. can the product be used as a blush & lipstick), is the product limited edition or a permanent product, is the product part of a collection, is the product consistent (from shade to shade, if an eyeshadow palette) from color to color in a part of a collection and does it function and operate the same each time applied. I purchased the Colourpop No Filter Foundation in Medium/Dark 135 Warm ($12) & No Filter Sheer Matte Pressed Powder in Medium/Dark ($9) a couple of months ago. I have been testing it on and off for the last 6 weeks. Due to Colourpop’s increasing popularity shipping has often been a bit slower & delayed. With the launch of so many new products, including eyeshadow palettes, other eye products, and their new complexion products, it was reasonable to expect some delays in receiving products. One thing that is both useful and notable is the manner in which one is able to select their complexion products. Buying complexion products online can be difficult if you do not know your shade or have never purchase complexion products from a specific brand. Colourpop has a method in which you are able to select a shade from another brand, one you might own, and comparatively find your shade in the Colourpop Foundation. I used my Estee Lauder Doublewear Foundation shade, entered in the information, and was able to find my Colourpop shade. The brands you can comparatively select from currently listed on the Colourpop website are: MAC Studio Fix Fluid, Fenty Beauty Pro Filter, Estee Lauder Double Wear, Maybelline Fit Me, Nars Natural Radiant Longwear, & Urban Decay Naked Skin Weightless. I think the range of brands you can select from is pretty decent with the exception that perhaps another drugstore/affordable foundation be included in the selection like possibly L’Oreal Pro Matte or Wet n Wild Photo Focus. Or you can find your shades through a series of question starting with your undertone. The concept surrounding this foundation is that it is a natural/matte foundation, that is lightweight & long wear. Over a 6 week period I tested the foundation in varies temperatures (as summer change to winter here in Houston because that’s the only two seasons we really have), I used varies powders to set the foundation, and I wore the foundation in different settings like work, outdoor activities, and over the course of both long days and short periods of time (such as half a day). Regardless of the circumstances, the Foundation performed the same, with the exception that it performed better when I used my Too Faced Peach Perfect Mattifying Loose Powder. I found that no matter how I set the foundation, it transferred to items of my clothing and my cell phone. If you are looking for a purely matte foundation, you will not find that with this foundation, but it is more of a natural/matte or demi-matte finish. For me, it is personally a better foundation to use in the fall/winter months here in Houston because of the excessive heat and my combination skin. If you have drier skin, it is perfect to be used in any season/climate. This is marketed as an affordable foundation and promises certain attributes that seem to be true in some circumstances. Honestly, I have a stronger preference for either Maybelline Fit Me or Wet n Wild Photo Focus Foundations, both of which are less expensive and more accessible. Seeing as though those particular foundations perform better for me needs, I most likely wouldn’t repurchase this foundation, but that’s not to say it’s not a good foundation. I just prefer a more matte finish. This is definitely a product that depends on your skin type and in the winter time for those of us who live in excessively warm climates.